Surf Camp Algarve is located in a wonderful nature reserve in southern Portugal with access to the best surf spots on both the west and south coast. This is the perfect camp to surf, meet people and socialise, or just chill by the pool. Chilled surf camp with pool, garden, mini ramp and BBQ all surrounded by stunning scenery. Room options include the main house, bungalows and ‘Sheddies’ to suit your taste and budget. Puresurfcamps has been recommending Surf Camp Algarve, organised by Funride – Animação Turistica, Unipessoal LDA, to its customers for many years. The relaxing atmosphere, unbeatable natural setting, and the odd wild party evening, as well as the amazing surf make it a camp you can’t look past. The various types of freshly renovated accommodation can cater to every visitor’s desires. Whether you are after a bit more peace and quiet and choose one of the more secluded wood bungalows, or after more of a party atmosphere and stay in the dorm in the main house. There is accommodation to suit every guest and what they are looking for. The manager of the camp was born in the area with, it seems, a surfboard attached. He knows the coast, as well as inland regions, like the back of his hand and manages to find surf conditions to suit every level surfer, whether you are doing your first day or being guided to the biggest and heaviest spots on the coast. Each surf course consists of two lessons per day of around one and a half hours per lesson, meaning you’ll get your first experience of standing up soon enough. Options for the afternoons are endless and can be spent going for walks to nearby Raposeira, going on nature horse rides through the adjacent parks and beaches, skating the new mini ramp, doing yoga courses with qualified instructors or even getting massaged. In the evenings you can hang in the communal areas and play pool, head to Sagres with your new friends, or just relax and check out the countless stars. In the colder months, from November to May, where the temperature rarely gets as low as 15°C. The surf camp is centred around a main villa which is fully equipped with Satellite TV, lots of surf films and Wi-Fi. The villa is situated atop a hill with an amazing view of the surrounding nature reserve making it perfect for relaxing after a successful day in the surf. There is also the famous weekly BBQ at the camp which more often than not leads to some serious partying at the bars and clubs in nearby Sagres, which takes most guests through to the wee morning hours and beyond. Surf Camp Algarve is located 2 minutes on foot away from the village of Raposeira where you can find two typical Portuguese cafes and beautiful passageways with original architecture that are definitely worth checking out. The surf camp is located in southern Portugal and is close to the main surf spots, only taking 5 minutes to get to the southern coast, and 10 minutes to the west. The main building and the wooden bungalows are located within the National Park of Costa Vincentina which provides a breath taking views. Sagres and Lagos are also nearby, as is the Surf Lodge in Ingrina. Jump in a rental car and drive to the neighbouring small town of Sagres and check out the impressive lighthouse at Cape St. Vincent on the southwestern most point of Europe. Here you’ll get a great snack at a place called “Letzte Bratwurst vor Amerika.” For dessert you can pick yourself up a locally famous, homemade ice cream at “Alice” and walk along the beach at Mareta . In the evenings there are three main bars that really start to fill up around 23:00 and keep the guests with any musical tastes entertained until the morning. Samu has been the manager since Surf Camp Algarve was founded in 2002. He was born in the area and grew up on a surfboard so knows the coast like no other. He is the one that makes sure you get the ideal waves to suit your ability everyday. Plus, once a week he is behind the grill as head chef of the famous weekly BBQ. Linda, Samu’s wife, also manages the camp and comes from Germany. She is super friendly and will try to help with any question or requests you might have or help you out with any concerns regarding your stay. The two freshly renovated double rooms have their own modern bathrooms with newly fitted rain showers. They also both offer a relaxing view over the neighbouring nature reserve making them the perfect place to retreat to after a long days surfing to recuperate. There are two cosy wooden bungalows in the garden that also sleep 2 people and also have their own small bathrooms. The dorms have also been freshly renovated and each has their own bathroom with the option of a 4, and 6 bed room. There is also the possibility of staying in the wood bungalows in the garden. These provide a more relaxed and private experience away from the main house, while offering a tranquil view overlooking the horse paddock. Surf Camp Algarve also now has the option of choosing a Sheddy, which is a comfortable wood hut with a 1.5m double bed that sleeps two. The height is 2m, so there is enough space to comfortably stand up, as well as space underneath the bed to store gear and surf equipment. The Sheddies are the perfect choice for those of you looking for comfortable accommodation at an unbeatable price. You can also book a Sheddie by yourself for a small extra fee. If you decide to come in the cooler months, it is advised to bring a sleeping bag. For the Sheddies you have two shared bathrooms, one for men, and one for women with 2 showers and 2 toilets in each. We also have a new addition to the Surf Camp - The Deluxe Sheddie. This new addition to the camp is a larger version of the original sheddie and comes with plenty of storage space as well as two single beds. These deluxe sheddies are perfect for friends & couples who are looking for a budget friendly surf trip where you still get your own private space to retreat to. When choosing the Deluxe Sheddie you have the option of arriving any day of the week, with a minimum stay of 5 day, and an obligatory surf course. 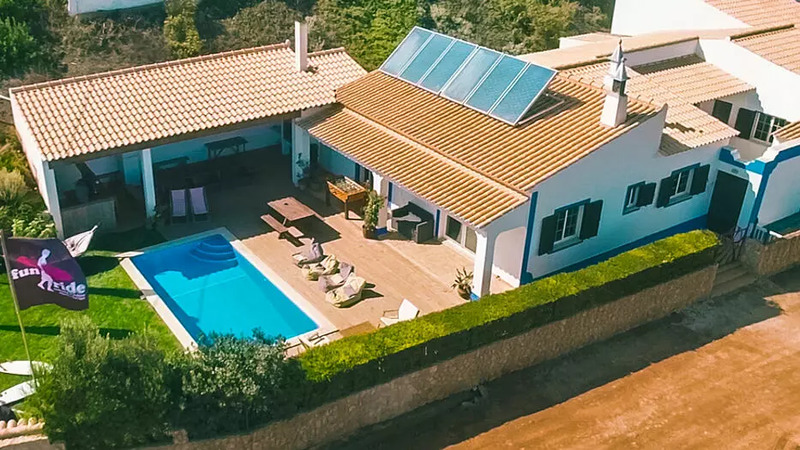 At Surf Camp Algarve there are double, and dorm rooms, located in the house and in stand alone bungalows that border the horse paddock as well as the newly added, and super priced Sheddies. There are communal areas as well like a living room, with couch and Satellite TV, pool table, Wi-Fi, and plenty of surf videos. Outside there is the pool, garden, a BBQ area and hammocks as well as a terraced area and bar. The surf course offers a perfect introduction for everyone that wants to have their first experience on a board. You’ll have a ton of fun with the experienced surf coaches who will get you up and riding on smaller waves quickly. At surf Camp Algarve there are the options of surf courses, or surf guiding. Beginner courses take place over a 5-day period where you will be taken to a nearby spot daily and surf around 3 hours per day, split into 2 sessions. In between these 2 sessions you can relax on the beautiful Amado Beach. The team always tries to keep the groups as small as possible to keep it safe and to make sure that each student gets some quality time with the coach. The surf course can be booked additionally with the price for the 5-day surf course costing 200€ from October to June, and 225€ from July till September. The surf course always starts the day after you arrive at the camp and continues for 5 consecutive days. The friendly local grew up in the area and has surfed his whole life and has even competed at a national level. He’s been coaching for 10 years, and when not teaching at the camp getting you up and riding your first waves in the bay, he’s training local youngsters and getting them ready for surf competitions. Rodrigo has everything a surf coach needs: he’s been surfing his entire life, he knows the Algarve like the back of his hand and he has years of experience with the surf school. At the weekly BBQ he is also very likely to be behind the grill working his magic while spreading his good vibes and happy mood. Surf guiding is designed to get more proficient surfers onto the best waves while giving them a few pointers to take their surfing to the next level. Price: 55 €/Day p.P., 110 €/2 Day p.P., 150 €/3 Day p.P. South Algarve, especially around Sagres, is inundated with various surf spots and breaks. The range of directions the beaches and points point, mean swell, wind and tide will align perfectly somewhere in the area to generate great surf. The team at Surf Camp Algarve will give you tips in regards to where you will find the best waves, or will take you there themselves. From June to September there needs to be a least 5 participants to take a guided trip, and from October to May there needs to be 2. Guiding without your own board is also possible, as rental boards and wetsuits available to rent. Your guide will be a local with tons of experience and you’ll be in a 4x4 that can get you of the beaten track and find less crowded secret spots. For one day guiding costs 55€ per person. For 2 days its 110€ p.P. and 3 days are 150€ p.P. The friendly local grew up in the area and has surfed his whole life and has even competed at a national level. He’s been coaching for 10 years, and when not teaching at the camp getting you up and riding your first waves in the bay or guiding you around the pristine Algarve coast, he’s training local youngsters and getting them ready for surf competitions. If its too expensive, or impractical, to bring your own surfboard its no problem. There are a bunch of surf shops in the area, including our own Puresurfcamps Shop, that can rent you softtops, shortboards and wetsuits. You can even rent boards and wetsuits directly from the beach at Amado. Surfboards cost 20€ per day, and wetsuits 10€ per day. If you choose to do a surf course these are already included. At Surf Camp Algarve there is a delicious, healthy, breakfast available every morning to get your batteries charged for a big day in the water. Breakfast includes Muesli, bread, cold cuts, cheese, fruit, vegetables and of-course coffee and tea to get you of to a great start every morning. Once a week the team at Surf Camp Algarve puts on a famous BBQ which only costs 15 € and includes fresh locally caught fish, salad and local wine. You can decide to join while you are there. The good food and great atmosphere have become legendary for a very good reason. Other evenings there are always plenty of options. The weekly program includes a trip to the pizzeria for the whole camp, the BBQ and a trip to a Portuguese restaurant. 3 x a week the in-house chef prepare home cooked, 3 course meals, for 15 €. Dinner plans are usually very relaxed and you can decide spontaneously, just let the crew know what you want to do when you are there. Yoga is a very good way to stretch your muscles and tendons as well as warm up before and after surfing or horseback riding! In the yoga classes on the beach, an experienced yoga teacher will help you to improve your balance and get your body in shape. It doesn’t matter how much experience you have, the courses are designed to suit all skill levels to relieve tension, reduce stress and prepare you for new day of surfing and horse riding. The Surf Camp Algarve is located in the Costa Vincentina nature reserve making it a paradise for horseback riding with awesome views of the countryside and the sea. Depending on your riding experience, the team will put together an individual program to suit you. Riding improves your coordination and balance as well as training abdominals and back muscles, relieving your spine and helping to prevent back pain. It makes you feel free and also helps to reduce stress. Above all, it is loads of fun, no matter if you’re riding in the paddock, the nature reserve or on the beach. Enjoy slow walks through the local meadows and woods as well as trots and gallops across the sandy beaches. The prices are 25 € for 45 min and 40 to 80 € for 1 to 3.5 hours. Detailed price overview under: Surf, Eat & Sleep Package, Eat & Sleep Package, Flexi Package & Optional Extras tabs. Arrive and Depart Saturday only! Special group discounts are possible! Just ask us! When taking part in the Surf, Eat & Sleep Package, the 5 day Surf Course is included. The Surf Course always starts the day after arrival at the camp, and runs for 5 consecutive days. When taking part in the Eat & Sleep Package, the 5 day Surf Course is NOT included, but can be booked additionally. When taking part in the Flexi Package, you can arrive & depart any day, and either a 2 or 5-Day Surf Course is included. Applicable for surf trips that are exactly 7 or 14 days. Arrival & Departure can occur any day of the week. Overnight prices are applicable for surf trips that are not exactly 7 or 14 days. Arrival and departure can take place any day of the week. The overnight price exclude the 2-Days Surf Course, which can be booked additionally for 100 €, or the 5-Day Surf Course for 200 €. *The Surf Courses always start the day after arrival. Surf Guiding October June 2 Surfers 60 €/Dayg p.P. 110 €/2 Days p.P. 165 €/3 Days p.P. Surf Guiding July September 5 Surfers 60 €/Day p.P. 110 €/2 Days p.P. 165 €/3 Days p.P. Yoga Session 10 € p.P. Dolphin Tour 35 € p.P. **Send flight, train or bus details directly to the camp manager after booking. Contact details are on your receipt. Surfcamp Algarve is situated roughly 6 km from Sagres and 15 km from Lagos. Faro Airport (60 km) or Lisbon (280 km). We offer an extra service where we will find you a cheap, available flight. We’ll double-check the prices and availability and will contact you with the final offer. Cheap flights are available starting from as little as 80 Euro! Best option is to fly directly to Faro (FAO) and then book an airport transfer. Another option is flying into Lisbon (LIS). RyanAir and Easyjet provide cheap and easy ways to get to Faro, Portugal from most airports in and around all major centres in the UK. For everyone that doesn’t want to book a rental car we will gladly organise a shuttle to pick you up from Faro airport and take you directly to Surf Camp Algarve. The shuttle costs 85€ per trip and takes about 60 minutes. If you make your own way to Lagos with the bus or train we can pick you up there as well for 25€ per trip to the camp. It is very important to send us an email with you’re exact arrival times and flight number so we can organise the shuttle correctly. Another option is to take a public shuttle bus to Raposeira, and walk the few minutes to the camp. You can pre-book this through www.faroshuttlebus.com. This does of course take a lot longer because it stops frequently. If you are booking this option, enter Sagres as your final destination, then tell the driver you’d like to get out in Raposeria. We recommend renting a car! In Portugal there are very cheap rental cars available that start at 80€ per week. At Sunny Cars you'll find the cheapest rental cars around! Getting a rental car will allow you to spontaneously explore the coastline. It will also give you the freedom to take early morning drives up the coast to go to your favourite surf spot and be first in the water.